There are a lot of temporary ways to add storage to your shower, from putting up a second shower rod to installing hooks to hang caddies from. But if you don't want to grab special supplies, use a suction cup and hair tie for a simple way to store bottles, scrubbies and sponges. If you don't already have extra suction cups and hair ties around, they're a much less expensive option than most DIY solutions, and you can probably grab them all at your local dollar store. You need one suction cup and hair tie (or a thick rubber band) per bottle. 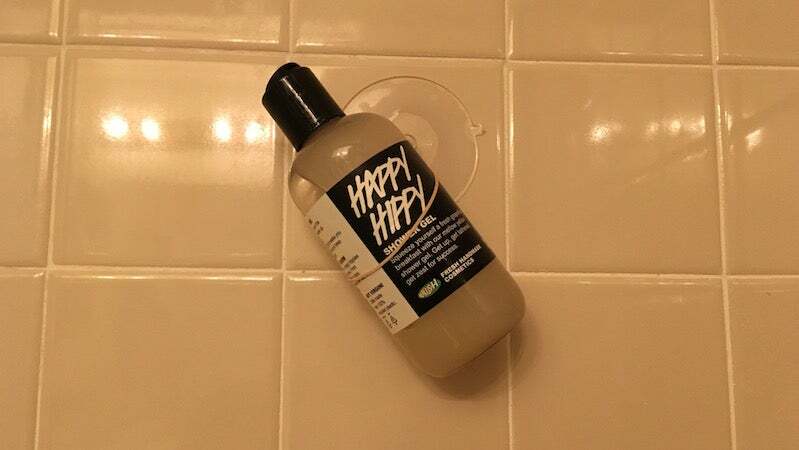 This works for pretty much any bottle, including shaving cream, and keeps them off the floor or from being crowded into the corner of the tub. Pull one end of the hair tie through the hole in the nub of the suction cup until there's a big enough loop for you to feed the other end of the hair tie through. Tighten the loop by pulling on the end of the hair tie. Attach the suction cup to your shower wall and put a bottle through the hair tie. The hair tie should sit around the middle of the bottle for best balance. Just make sure you have a good firm seal on the suction cup, because as it - and the bottle - get wet you don't want it to slip and fall.